Grantham and District Sunday Football League: Prem Div Cup Semi-Final: Osbournby Rgrs 6 - 1 Witham Wdrs; Prem Div: Ropsley 2 - 2 Lions. Div 1: Caythorpe Sp & Soc 4 - 4 Ruskington; Holdingham 1 - 0 Ancaster Ath: Nobody Inn Ath Res v Digby Lions (Home Win). Fixtures: Premier Division Cup Semi-Final: Ropsley v Nobody Inn Ath. 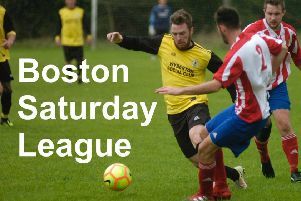 Prem Div: Helpringham Rovers v Lions; Div 1: Ruskington - Totemic; Holdingham v Colsterworth Utd; Nobody Inn Ath Res v Ancaster Ath; Caythorpe Sp & Soc v Digby Lions.